Peregrine nesting season is in transition. Some nests have fledged, others are still in progress. 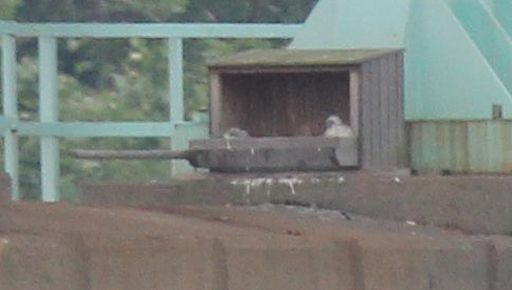 Here’s an update from last week’s most active peregrine sites in southwestern Pennsylvania. Peregrine watching was exciting near Heinz Chapel last weekend. Peter snapped the top photo around 3:30p on Saturday (June 2) as Hope flew away from two aggressive juveniles on the Heinz Chapel roof. She was carrying prey but she wouldn’t let them have it because it was part of her lesson plan. Ignoring the lesson, they rushed her. I joined Peter at 4p and we walked — sometimes ran — to follow the action in the air. Overhead two really loud juveniles whined for food, flew at breakneck speed, and chased their mother. On the ground, wedding after wedding emerged from Heinz Chapel and posed for photos by the lawn. Eventually the two dramas nearly collided. Dangling prey, Hope flew from Heinz Chapel toward the Cathedral of Learning urging a juvenile to flip upside down to receive it. He flipped, she dropped it, and … he missed! Good thing it hit the lawn and instead of the bridesmaids! 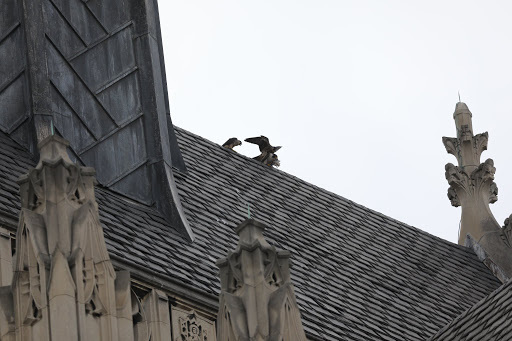 The two youngsters fledged May 29 and 31, spent the first few days landing on the Cathedral of Learning, then graduated to Heinz Chapel and Alumni Hall. By yesterday afternoon, June 4, the entire family was hard to find. They’re further away from home as the parents teach the young how to hunt. 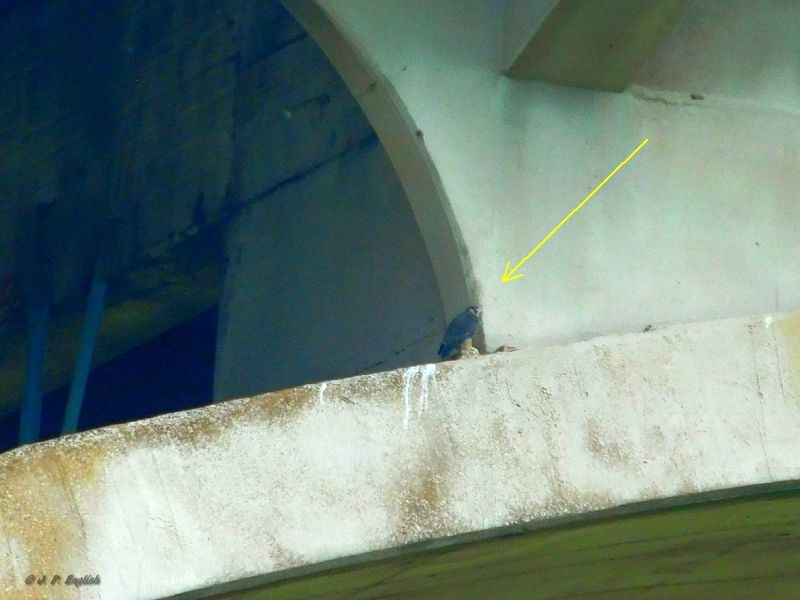 John English and I visited the Westinghouse Bridge around noon on Sunday June 3 and found the juveniles ledge walking and shouting at their mother, “Feed me!” We eventually saw the entire family — both adults flying and three juveniles on the arch. In the photo below, a juvenile has his head turned away to look at his mother. You can see the “eye spots” on the back of his head that are meant to fool predators. 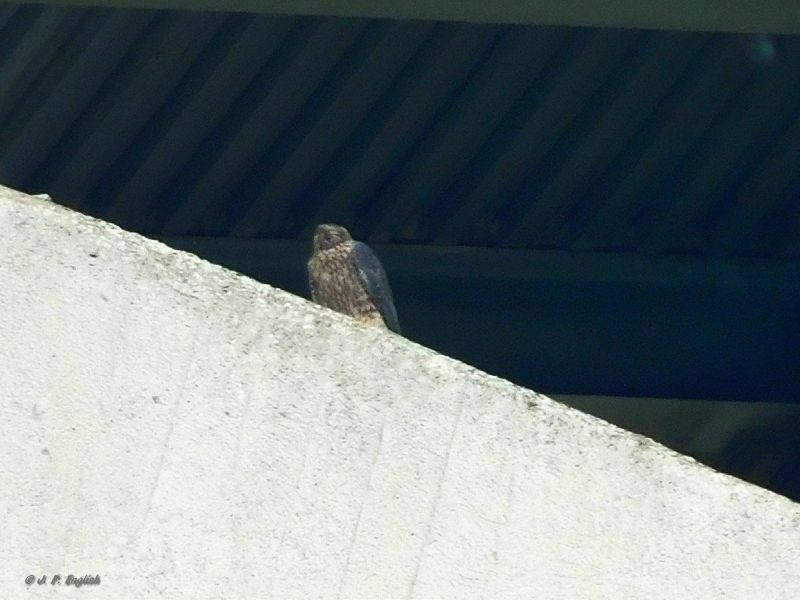 UPDATE, Tuesday afternoon, June 5: Sadly another juvenile peregrine was found dead on the bridge deck (road surface) this morning. Game Warden Doug Bergman retrieved its body. 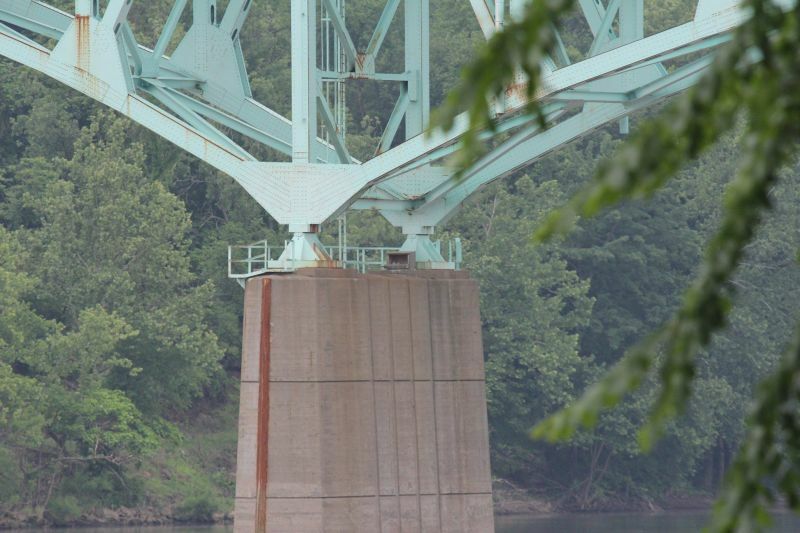 Amber VanStrien has good news from the Tarentum Bridge last weekend. Using her zoom camera from the nearby upstream park she photographed two chicks moving around in the nest box. If you’d like to see this family for yourself, click here for a map. any sightings of Dori and Louie downtown, Kate? I know they are not active now that chicks were removed. Also, any update on those chicks and whether they have been released yet from HAR in Verona? Thanks for your thoughts. Judith, very little to report. Lori Maggio saw one of the adults perched on Oxford Center on May 31. No news about the chicks. Hi Kate, I’ve seen you mention the downtown nest being too low. Isn’t the Tarentum box too low as well, and being over water, are the falcon chicks there doomed to drown? Stephanie, … not too low. 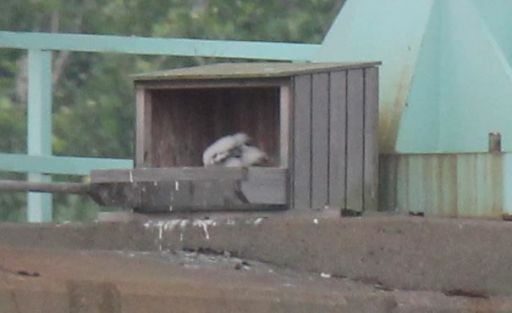 The Tarentum Bridge nestbox is in the best possible place for that bridge. 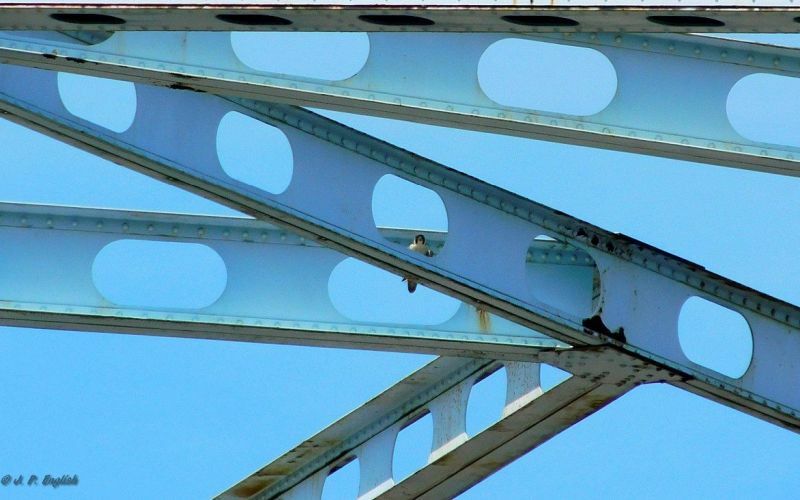 Prior nesting pairs nested in cubbyholes in the bridge structure which meant that fledging birds had no place ledge-walk and practice flapping so they launched directly out of the cubbyhole into the river. 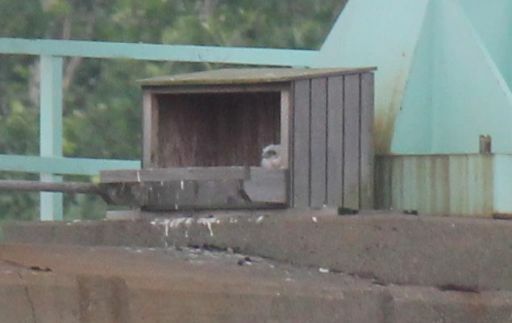 In years when young were banded at Tarentum, the PA Game Commission put the chicks at this location after banding and the young fledged successfully — much better success than any other location on this bridge. It’s too bad that the parents can’t realize that there is no place for the young to exercise when they build their nests in the bridge superstructure. Did the game commission band the chicks that were taken from downtown? Do they band fledglings that are rescued since they know what nest they came from? Our house has become a favorite nesting place. Last year we had an eastern phoebe nest above our front door, and a mourning dove nest on the shelves on our back porch. This year a robin built a nest on top of an outdoor curtain that we have tied to a post on our front porch (the chicks are about ready to fledge), carolina wrens nested inside our porch roof and they are already gone, and a cardinal has just built a nest and laid eggs in a tangle of rose bushes behind our house, so close to a window that we can see into the nest. We’ll have to put something over the window because when we move around in the house it disturbs her and she leaves the nest. It’s weird that birds will nest right on top of places where humans live, even though they are afraid of us! Banding peregrines: PGC bands them when they can but most staff are not licensed to band peregrines.